To say we were awestruck when we first saw Katie Kortman’s hand-painted dress for the Sew Frosting challenge would be an understatement. 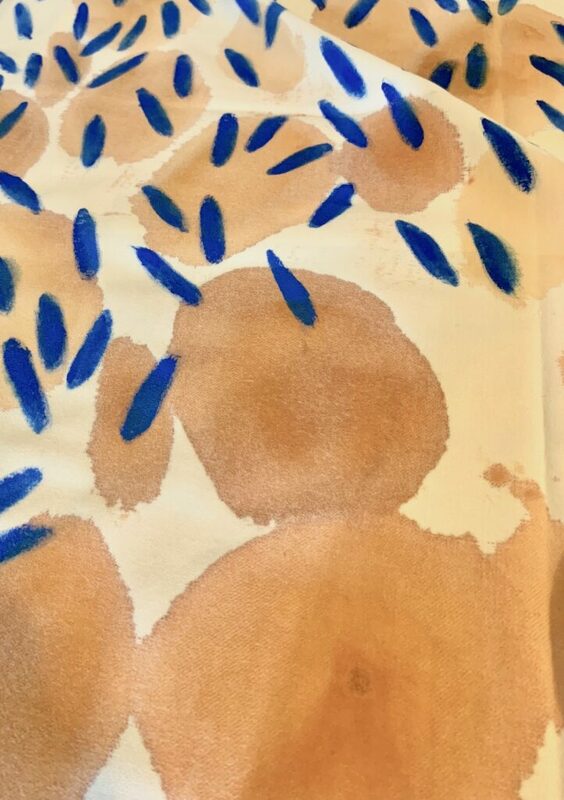 As soon as we laid eyes on this gorgeous make, we knew two things: 1: We had to find out more about this amazing dress and 2: How can we get this design on fabric? 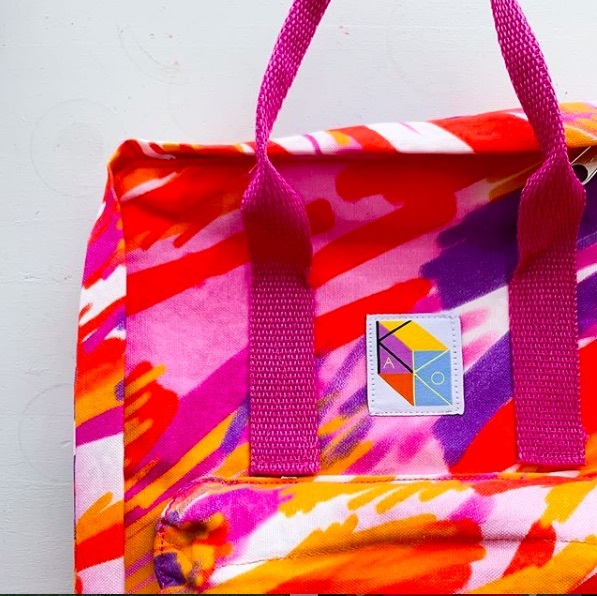 Keep reading to see how this one-of-a kind sewist turned her watercolor artwork into a repeating design, now available in her Spoonflower shop! Katie: I have been an artist my whole life (went to art school starting in 7th grade) but developed a love (read: obsession) of sewing in my adulthood. 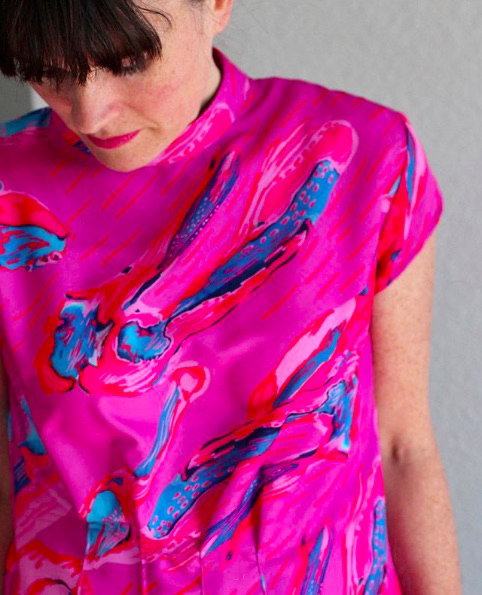 Naturally, I always thought it would be incredible to see my artwork on the clothes I sewed. In January of 2018 I made a list (inspired by Gretchen Rubin) of 18 things I wanted to accomplish that year (a “happy goals” list). One of the things I put on there was to design my own fabric. The only problem was, I didn’t own Adobe® Photoshop® and I didn’t know how to create a repeat (two pretty important skills)! 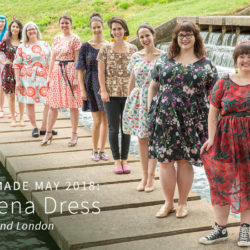 I saw the Sew Frosting contest that indie pattern designers Kelli and Heather were hosting, and decided to use that as my personal deadline to finally accomplish that fabric design goal. 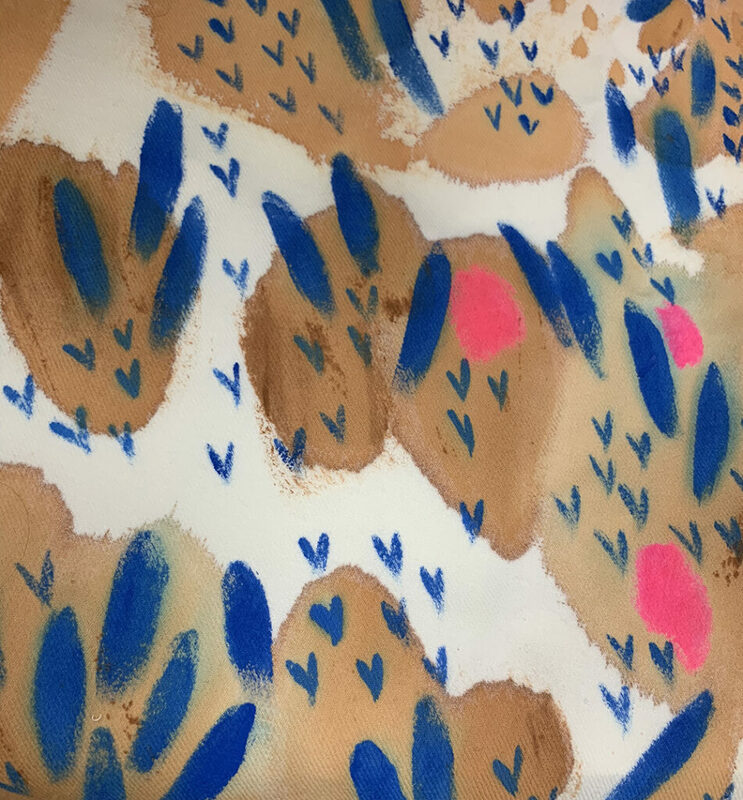 As the deadline neared, I realized I didn’t have time to figure out how to do it digitally with Spoonflower, so I did what came most natural – I hand-painted it. Taking at least 20 hours to paint 2.5 yds of fabric required to sew my dress, it was a true labor of love. I got the dress sewn JUST in time for the contest and guess what?!?!? I was one of the three category winners out of 2000+ submissions. I was blown away. Katie’s sew frosting entry took over 20 hours to hand-paint! A few months later I decided, with the encouragement from Spoonflower, to make that print digital (and therefore re-printable). I subscribed to Adobe® Photoshop®, watched and read some tutorials on how to make a repeat and learned how to use the Photoshop tools. I was ready. First, I painted the same motifs I’d used on the fabric with watercolors and paper. I kept each motif separate so they would be easy to select with the tools on Photoshop. As you can see below, I created a separate layer in Photoshop for each motif and then set up the final design as a half-drop repeat. Katie highlights the steps of her design process. 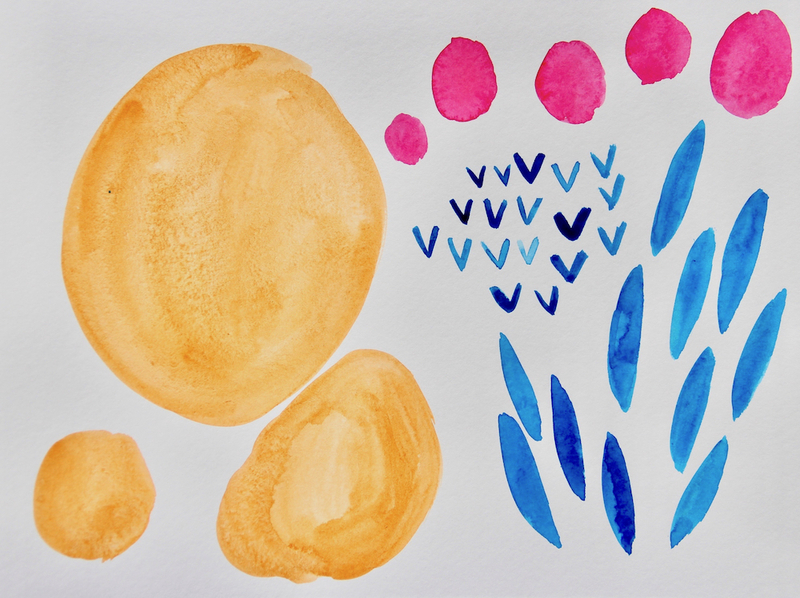 I smoothed out and adjusted the opacity of the original water-colored pink circles (1). I did the same to the edges of the blue seed/leaf shape (2). I used the paintbrush and paint bucket tools for refining the edges. The tan background blobs (3) were kept in their original watercolor state so that it felt more like the original, but I again smoothed the edges a little using the eraser tool. The little “v” shapes (4) I re-drew on my Wacom tablet instead of trying to select and cut out the hand-painted versions. It was faster for me to draw them all over the square after I’d dragged the blue-seed repeat on top of the tan watercolor blob repeat (believe me, I tried both ways). I then dragged the pink circle file on top and finished the design! 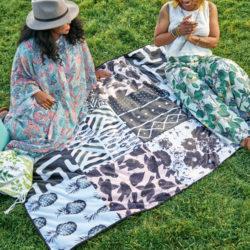 My favorite part was seeing how it would look on a yard of fabric. I used the “Project Paras” extension in Photoshop to create all of the repeats. I learned a lot trying to make my painted print into a digital one. Since making this first design, I’ve turned many more of my original paintings into prints, which you can find in my Spoonflower shop! The next step, which was incredibly exciting for someone who sews her own clothes, was to sew the fabric into something for me to wear. 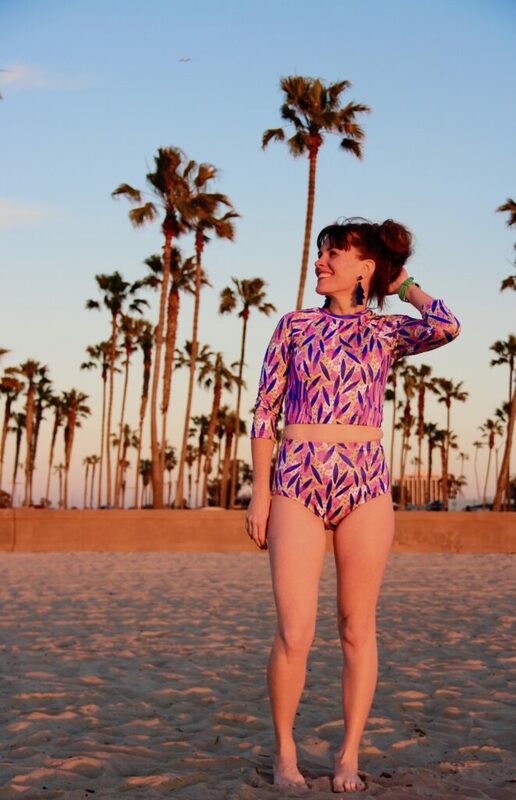 I decided on a swimsuit and used the Sport Lycra and a McCall’s pattern to make the high-waisted, elbow-sleeved, ready-for-anything swimsuit of my dreams. More on how I did this and how I hacked the pattern to include a shelf-bra is on my blog. If you look closely, you can see a little contrasting detail on the sides. 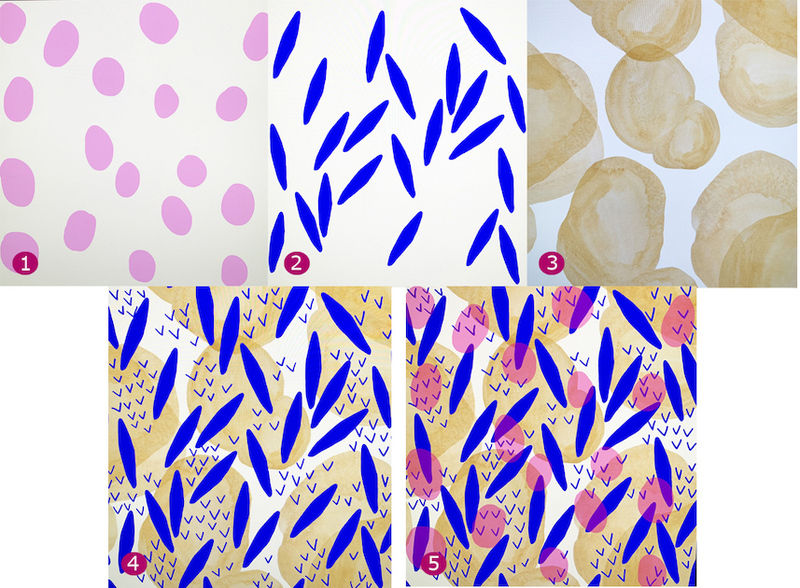 I created a coordinating pattern with simple dashes (using my Wacom tablet) out of the same colors as the “Sew Frosting” print so I could do some pattern mixing but still have them match. Question: Do you feel like something is missing from that beach ensemble? Do you ever wish you had something to throw over your suit that you could also wear to the office? 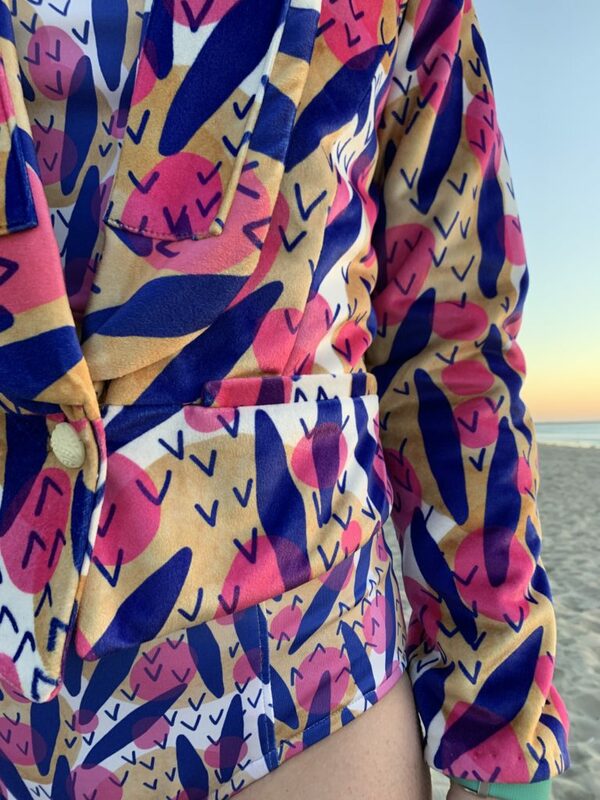 If it looks like the blazer print is larger than the swimsuit, that’s because it is. I made the pattern in two different sizes because it felt like they were better suited for different applications. (I actually have more than two different size and color options for this print in my shop.) 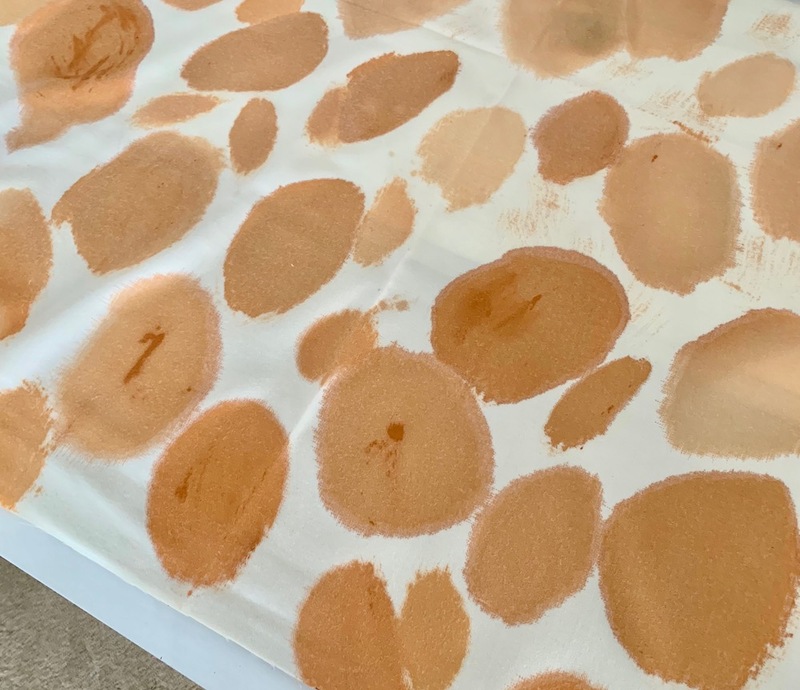 Ahhhh …..the beauty of designing your own fabric. 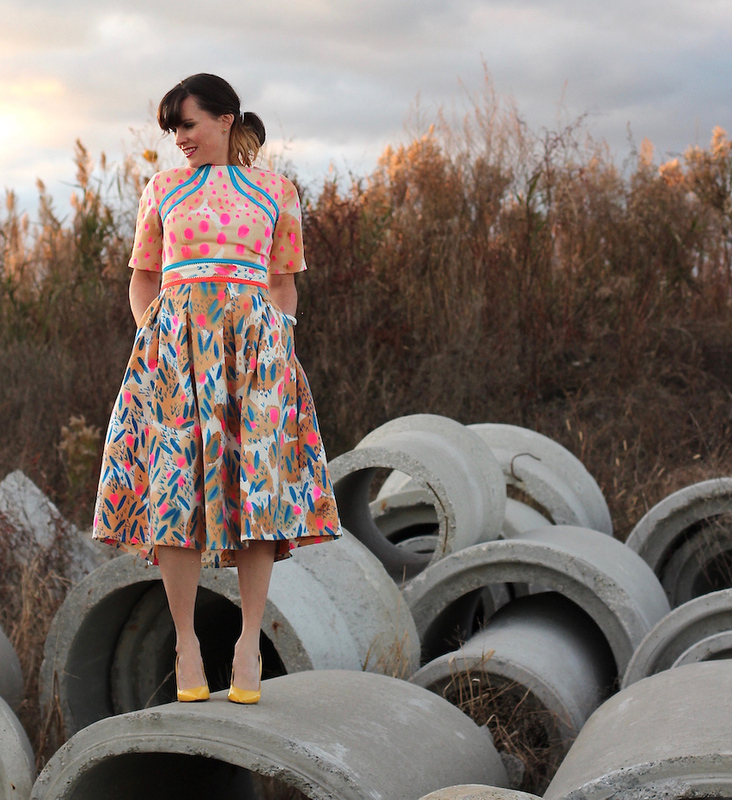 You know what designing my own fabric and then sewing it up into clothes made me want to do? And also dance (always). I mean….. I AM the creator of #thehandmadehustle. 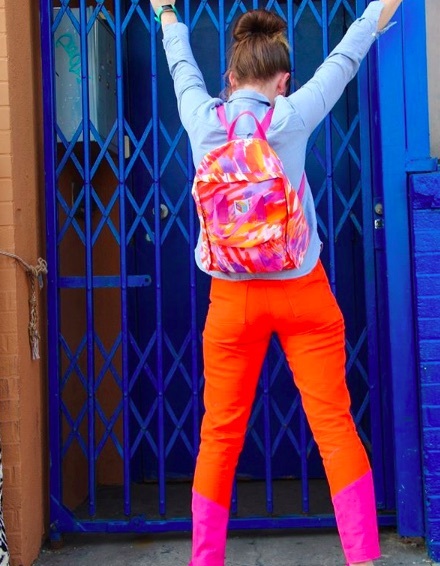 Katie Kortman is a sewist, artist, and self-proclaimed dancing queen. Over the years she has sold her artwork in galleries, worked as a display artist for Anthropologie, taught high school art, had a handmade accessories company called Blue-Eyed Freckle, and mothered her four children. She has lived in many places around the globe as the wife of a Navy Doctor, but currently resides in Virginia. 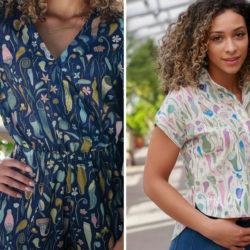 Katie enjoys combining her passions into one by using her artwork to design fabric on Spoonflower, that she can then sew up into clothing (and DANCE). 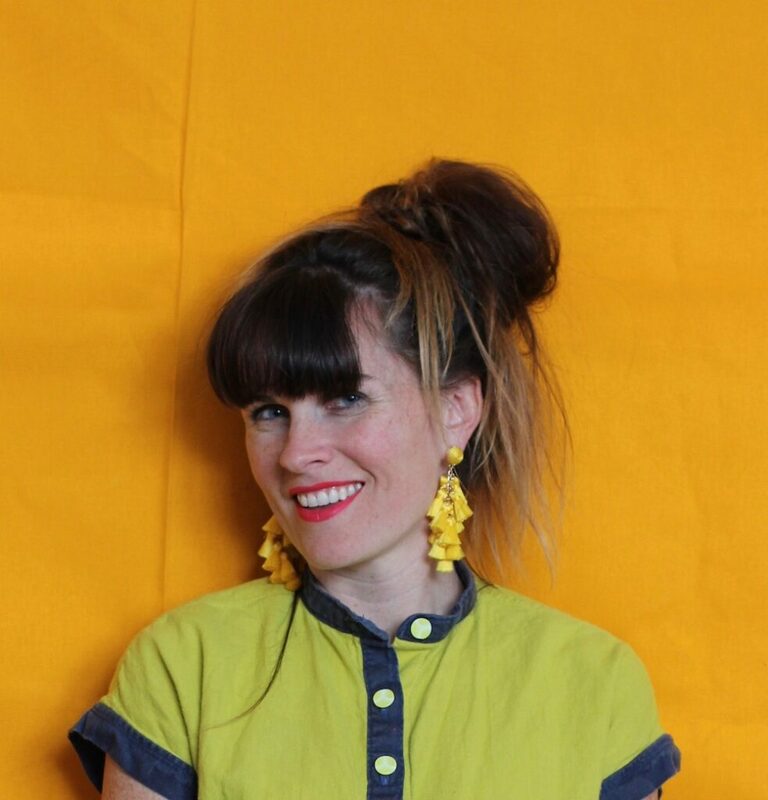 She blogs at katiekortman.com and over on Instagram you can find her @katiekortmanart where she dances around in her handmade wardrobe. WOW! Thanks for this Katie! I might actually be able to do this, LOL. But seriously, the way you’ve outlined and explained the steps….makes it look doable. Thanks for sharing! 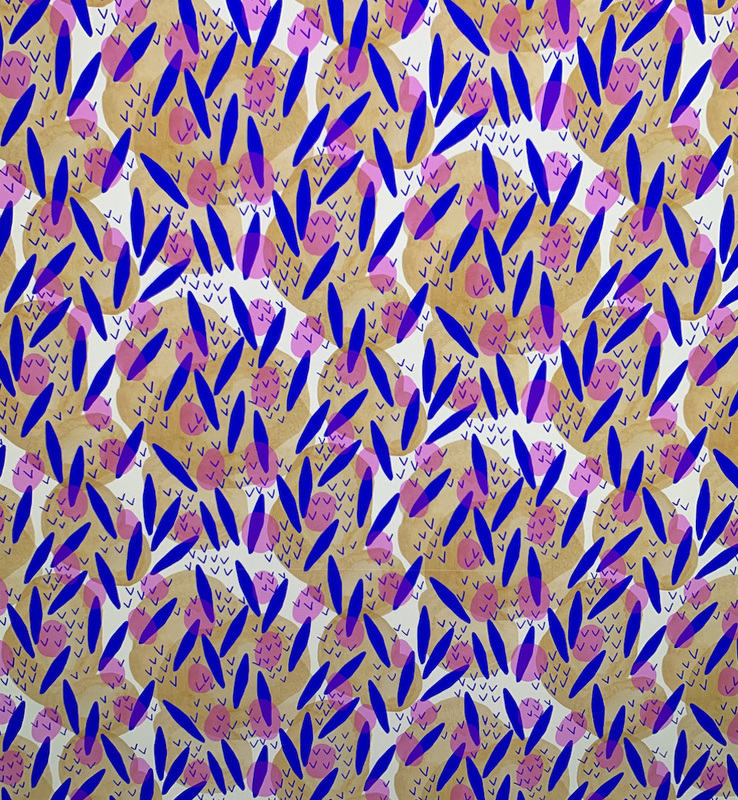 Surface design….I haven’t been thinking of much else since meeting you…so yes, it will happen!